Well….here we are - our LAST DAY of our Spring Fever! I hope you have been enjoying the free lessons and getting good and inspired! Today, I’m bringing you my mini lesson for Let’s Face it 2017! 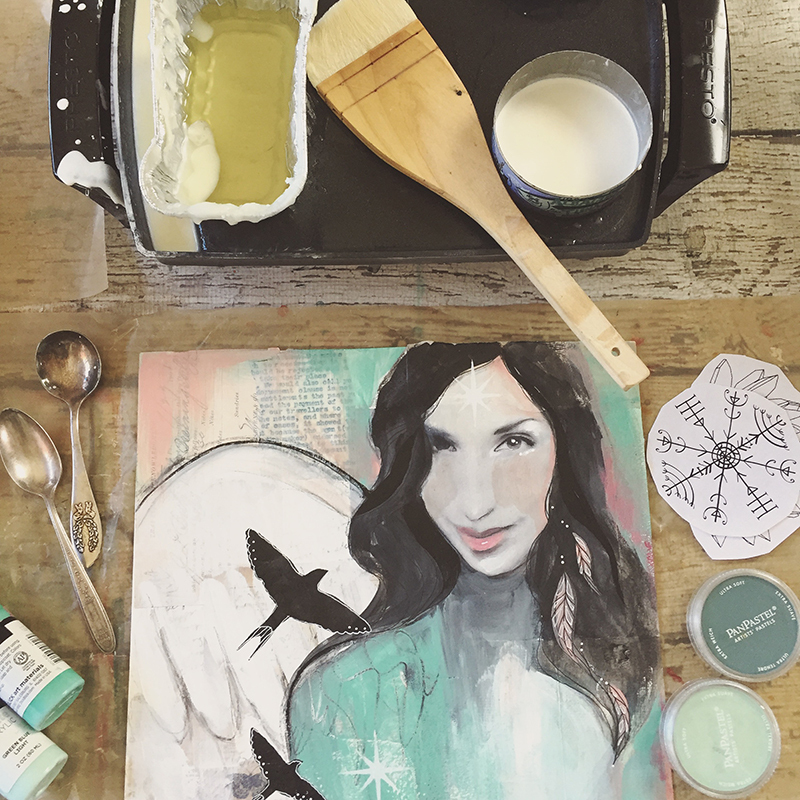 This is a really fun mixed media encaustic portrait lesson and I do hope you enjoy it! Again, if you are not into encaustic you can skip the wax layer! Hope you enjoyed that! I can’t wait to see what you create! Thank you so much for following along with our Spring Fever celebration. It has been so much fun to hear your feedback and see your creations pop up in the Facebook group! 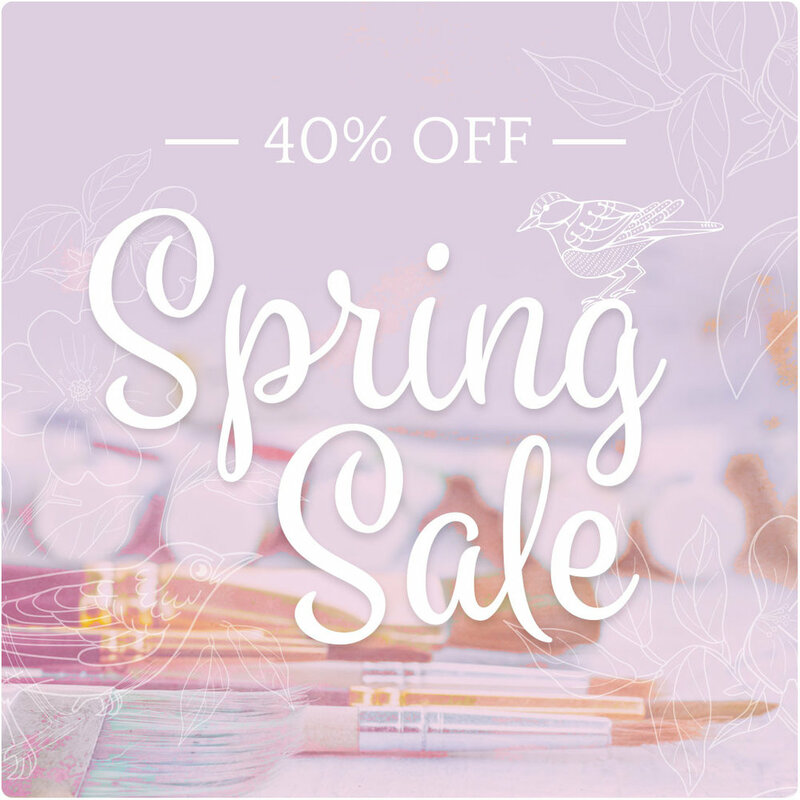 This is the last day to enjoy the sale but I will keep these pages up for the entire month of April so take your time with the free tutorials! Much love and gratitude to you all! Wherever you are in the world, no matter the season, I hope creativity is blooming in your life. I do hope your week is going well! 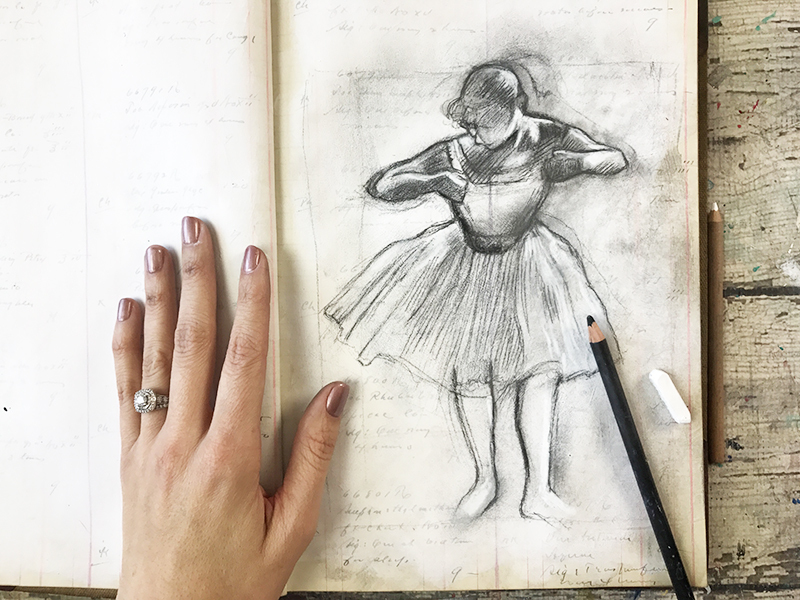 We are already on Day Four of our Spring creativity celebration and I’m feeling rather playful today! I think we should take a peek into the fabulous class by Yvonne Morrell!! What do you say? Let’s do some one line drawings with her! 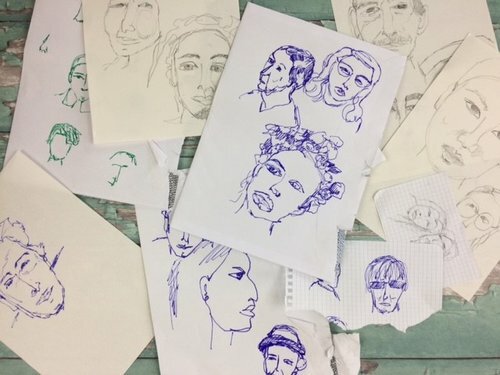 One line drawings and blind contour drawings are an excellent way to loosen up and freshen your portraiture style plus it’s really fun! Hope you guys enjoyed that! I would love to see your wild and crazy drawings in the Facebook group! Feel free to share your favorite ones! Hello lovely friends! Did you enjoy that beautiful video with Donna Marie yesterday? So inspiring right? Let’s get going on Day Three! Spring is a time for the celebration of life and throughout history it was a time for festivals of flowers and dancing! It makes me think of ballet dancers in soft pastel colors! So I thought, what a perfect day to share a full lesson from my class, Lovely Dancer! Hope you enjoy this lesson! Make sure you share your drawings in our Facebook group! Hope you are all doing well! Let’s begin our Day Two! Spring is such a magical time to get out in nature! Full of singing birds, flowering trees and baby critters! How can you not love it!? Being inspired by nature is often so incredibly vital to artists. One artist that is also one of our fabulous guest teachers is deeply moved by the miracle of nature and this is seen in all she creates. 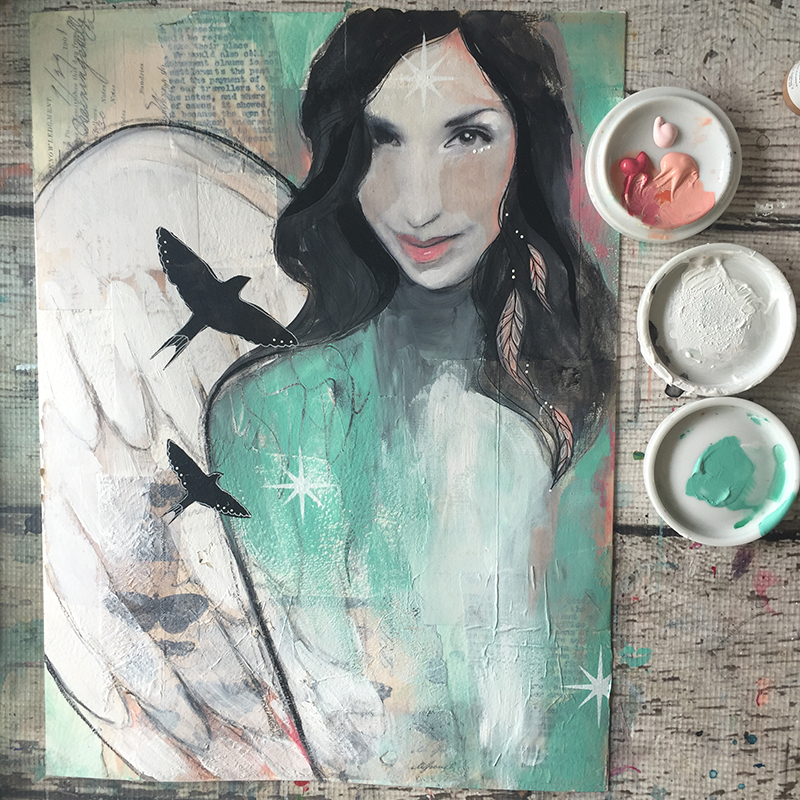 Today, we are sharing the bonus lesson from her wonderful class, Upon Healing Wings! To learn more about Donna Marie you can visit her here. Are you ready to celebrate Spring with me! It’s Day One of our Spring Fever! Spring is such a beautiful time to refocus your energy. While winter is reflective, Spring can be a time of fresh ideas, renewed energy and luminous light! It’s also a great time to show yourself love! So today I have a fun self-portrait collage project for you. This was my lesson for Lifebook 2016 and it was such a delight to create! It is all about self-love and it’s entitled “Be Your Own Angel”. ***Please note this is a mixed media encaustic project but you can totally skip the wax layer if encaustic is not your thing! IF you do choose to add the wax, I highly recommend you do this on a wood board or rigid substrate. I originally did this on heavy watercolor paper which made it rather fragile. Hope you enjoyed this! Share your creations with our Creative community on Facebook! I would love to see what you make!